There is a minimum stay of 7 nights during the high season: December 20 through January 03. Effective December 31 2006, the US government now requires passports for all air and sea and land travel to or from Canada, Mexico, Central and South America, the Caribbean and Bermuda. Passports are required by ALL persons to enter the United States whether citizens or non-citizens. Lost Keys, Lost Electronic Controls and/or general damage: A charge of $25.00 US will be incurred for each set of lost keys. Should you also lose a safety deposit box key along with a set, the charge will be $100.00 US. Loss or damage to any of the remote controls for the TV, VCR, DVD or air conditioning, will be charged at $50.00 US per unit. Lost towels will be charged at $25.00 US. Broken windows, mirrors, doors, etc., will be evaluated by our Agent and will be charged at cost of replacement/repair plus labor. Telephone Service: Incoming long distance calls will be received, outgoing long distance calls are blocked. For long distance please use your mobile 'phone or calling card. To obtain an outside line, dial 0. Using your cellular 'phone, the code for National (Mexico) long distance is 01+area code+telephone number (a total of 12 digits). Again, using your cellular 'phone, the code for calling the USA and Canada is 001+area code+telephone number (a total of 13 digits). Local calls simply require the telephone number (a total of 7 digits). You can create a very big, nasty surprise for your self which will await you on return from your vacation if you use one of the telephones that say 'Call Home Collect' using your credit cards. These are a huge scam and you should avoid them like they had the plague! Cellular Telephones: Almost all United States and Canadian cellular 'phones may be programmed for local use in Puerto Vallarta through the local carriers, Telcel and IUSAcell. Dialing to a cellular 'phone from a land line or another cell 'phone is fairly simple: just dial 044-322 followed by the seven digit number of the party you are calling. High Speed Internet Access: For those of you who just must have your daily fix of web cruising and can't be separated from your emails longer than 8 hours, we have succumbed to your many requests and now provide wireless Internet connections. Just open your beloved laptop anywhere within the penthouse and you will have a snappy link to the rest of the world and upload all those marvelous photographs. You will also find a docking station for your favorite traveling companions, your iPhone and/or iPod, iPad. 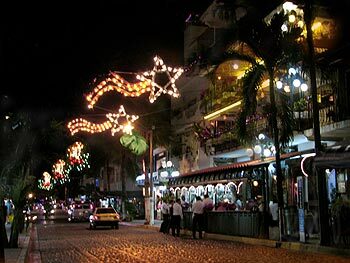 Calle Olas Atlas is the heart of Old Town Vallarta. From dawn to the wee small hours of the night, here is where it's at!